Oh yes. It’s a banana nut muffin inside a pancake. Don’t ask me how I did it. I’m still a little unsure. First, I started with a mashed banana. Mash, mash, mash. Isn’t this fun? Then we added some wholesome partners in crime including flax seed, walnuts, almond milk, and whole-wheat pastry flour. Although those eating gluten-free could substitute a gluten-free blend or oat flour and likely achieve similar results. I also added a bit of streusel because the blueberry muffin pancakes (seriously, best ever) performed so swimmingly with the addition. Ooh, la la. Also, these cakes are vegan, come together in about 20 minutes, and require only 1 bowl. Huzzah! A wholesome, hearty vegan pancake with no added sugar besides a dash of raw sugar in the streusel mix. They aren’t the fluffiest pancakes I’ve ever made but that’s OK, because they taste just like a banana walnut muffin. Woohoo! Friends, we have officially re-entered breakfast heaven. 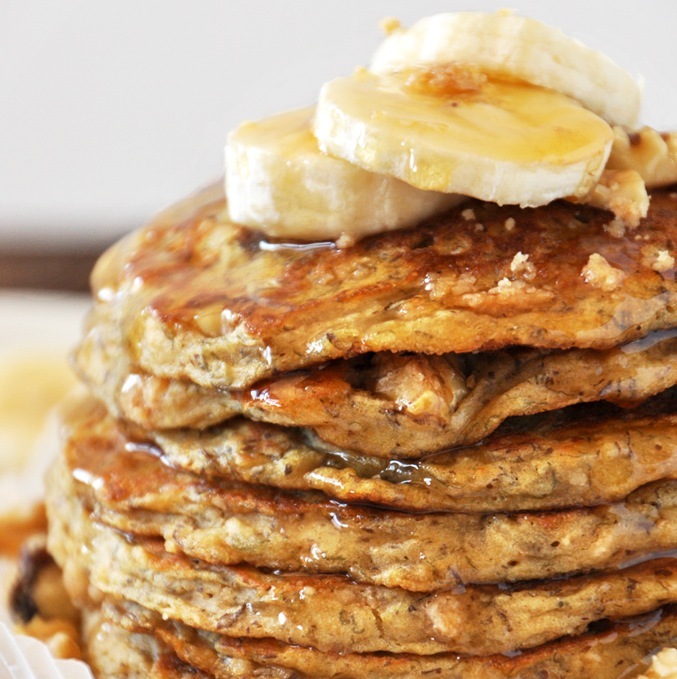 Hearty, healthy, vegan pancakes that taste just like a banana nut muffin. 30 minutes start to finish. Preheat oven to 350 degrees F (176 C). Prepare streusel by combining sugar and flour in a small mixing bowl and then cutting in Earth Balance until well combined. Spread on a baking sheet and bake for 5-7 minutes or until it turns light brown. Remove from oven and set aside. You will have leftover streusel. Lightly grease your griddle and pour 1/4-cup measurements of the batter onto the griddle. *Because there is a whole banana in this recipe, make sure your cooking surface is on medium heat and you cook the cakes all the way through - this may mean 3-4 minutes on each side. If your skillet is too high, they'll cook too fast on the outside and stay tender on the inside. These look delicious! Do you have a suggestion for a low-sugar/sugar free topping? Fresh berries or a fruit compote would be delicious! Been using this recipe for banana pancakes for the last year or so and they come out amazing every single time. I now buy bananas exclusively to make these. Definitely my favorite! Delicious and surprisingly filling! Added a sprinkle of cinnamon with the streusel and walnuts while cooking but other than that followed the recipe exactly and they turned out great! I have made these pancakes several times and have had a really hard time with the batter consistency. I cannot get them to hold together and cook evenly or all the way through. It is like the mashed banana doesn’t cook at the same rate as the rest of the ingredients. They are delicious, but really ugly pancakes. Any suggestions? Looked like the batter was great texture, but didn’t work for me. never cooked through properly despite low and slow cook. Looked good, tasted good, but uncooked. I made this today for breakfast. Turned out really nice. I normally don’t like pancakes because they’re too sweet and heavy, but these were perfect! Will definitely make again. Next time I will only make a 1/3 or 1/2 of the the streusel. 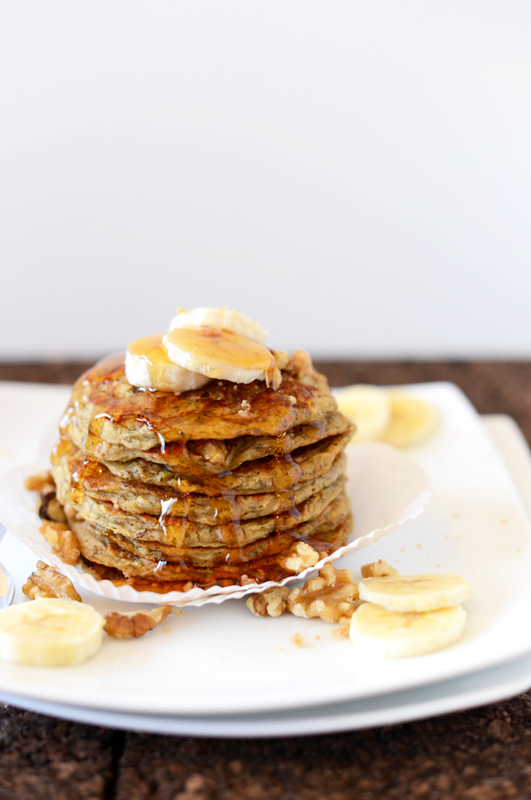 This is by far the best banana nut pancake recipe I have ever tried! Please do yourself a favor and make this. It is amazing! Thank you so much Dana! I’ve made these twice now, and they are amazing!! I did have to add slightly more flour than the recipe states which helped with the batter being gooey and not cooking through. I also left out the flax egg and no problems there. I completely omitted the flax eggs since these contain banana (and I didn’t have flaxseed on hand), and they still turned out fantastic!! First, I would like to say I am a big fan of you. I have been vegan for about a year & following you for at least 6 months now. You have made my cooking and baking life significantly easier and more fun on numerous occasions. That being said, I’m telling you these are my favorite pancakes I have ever had. So, thank you especially for this deliciousness. Thsee were wonderful! I didn’t have any almond milk and used water instead, they still turned out perfectly! My husband and I really enjoyed these. We substituted soy for almond milk and pecans for walnuts, but the results were still wonderful. The streusel didn’t come out quite right, but we just moved and I’m still trying to get used to this oven. This recipe was a total bust. Wow, I was so inspired by your pics, I jumped right in and made them with 2Xs the flax, no soda, no earth balance and only whole wheat flour. I made it the size to fit the whole pan, filled it with applesauce and whoopee!!!! I followed the recipe using a flax egg, and the first pancake completely fell apart in the pan. I added a chicken egg and some more flour to the remaining batter and it turned out great. I realize this makes it not vegan, but posting in case it helps anyone else. Did anyone else have the problem of them sticking to the pan? I tried making it more liquid and adding more flour, followed the recipe exactly, use a non stick pan… They smelled amazing but they were impossible to cook. Very disappointed. I’m in heaven eating this right now!!! It’s so good! THANK YOU!! Another great vegan breakfast recipe! I opted out of the streusel and we’re a nut free house but they were still amazing! I added cinnamon to the batter and they were delicious!! Yay! Glad you liked them, Shelley! These pancakes look absolutely fabulous! :-) What a cute color they have, can’t wait to try them next weekend. I love to prepare and enjoy special breakfasts on sundays so I’m sure your recipe will be a winning bet! Thank you for sharing a delicious recipe! It became a dinner hit. I just made these pancakes this morning, and they were absolutely delicious! My husband and I both loved the crunchy streusel on top of the soft, yet dense pancakes. Filled us up quickly! It was a little sweeter than I usually like for breakfast, but we will definitely make these again. Thanks for all the great recipes! So glad you and your husband enjoyed these, Carissa! I’m not sure where I went wrong, but no matter what I did, these would not cook through. I started off with my electric griddle on 350 as the recipe suggests, but the outside cooked way too fast. I turned it down…they still didn’t cook. I put them in the oven in a futile attempt to get them to cook through…no go. Still gooey in the middle. I’ve never had much luck with banana pancakes, but I was so hoping for a better turnout with this recipe! Hmm, perhaps there was too much “wet” to your batter? This may have to do with how ripe your banana was/how large it was – that’s usually the corporate since bananas don’t cook through without enough wet to thin it/dry to dry it out, if that makes sense. Next time I’d recommend adding a bit more almond milk to thin out your banana, and then compensating with flour to thicken up the batter. Hope that helps, Heather! These turned out delicious! I recently found I was allergic to eggs and milk and so my breakfasts have been very sad. I have been trying to find a recipe for pancakes that would bring me back to before my allergies! I believe this is it! I omitted the flax as banana is an egg substitute anyway. I added a 1 tsp of cinnamon and 1/4 tsp of nutmeg to spice things up. I also used water not milk. Delicious. Thanks so much for this recipe! Love the gifs! These look so hearty! 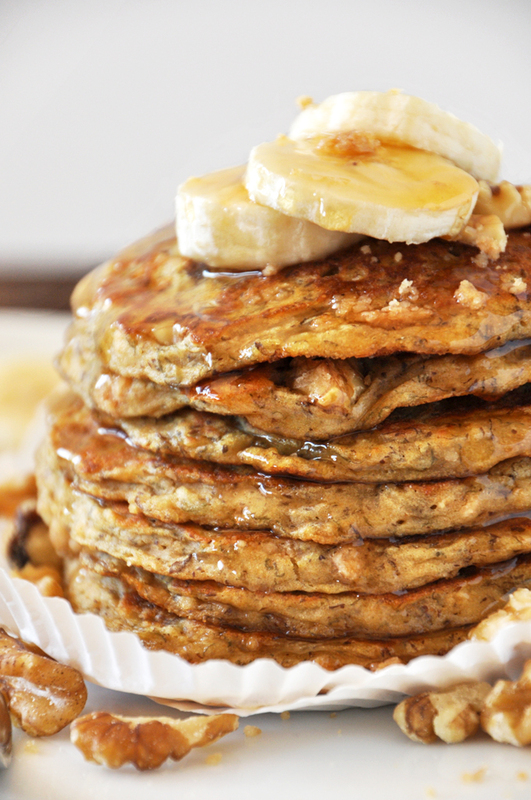 These pancakes look awesome and sound pretty healthy too. Always a good combo! I just inhaled about 1.5 servings worth… SO DELICIOUS! I am insanely stuffed right now but it was worth it. I really enjoyed the more dense muffin like texture to these. Thank you for your great recipes and your inspirational blogging words. I just enjoyed these with almond butter, virgin coconut oil and maple syrup…Delightful!!! Wooow!! These pancakes look amazing! I’ve been searching for a banana pancake recipe and I will try this one! Thank you for sharing! this sounds so good i could eat that stack! Wow just made these for breakfast. Sooo good! I used whole wheat spelt flour in the streusel and in the pancakes. They both turned out great. Also didn’t have almond milk so used water instead. I am keeping this recipe around. Probably my favorite pancakes ever!! Thank you! These look so good! For the streusel, can you use another type of flour instead of unbleached all purpose?! Oh yum, your pancakes look incredible! I love banana pancakes! I think your blog is so fantastic. I feel inspired every time I stop by. Those look and sound great and healthy to boot! I love your moving demonstrations or pictures. Very cleaver! This is one pancake recipe that I’m going to try. 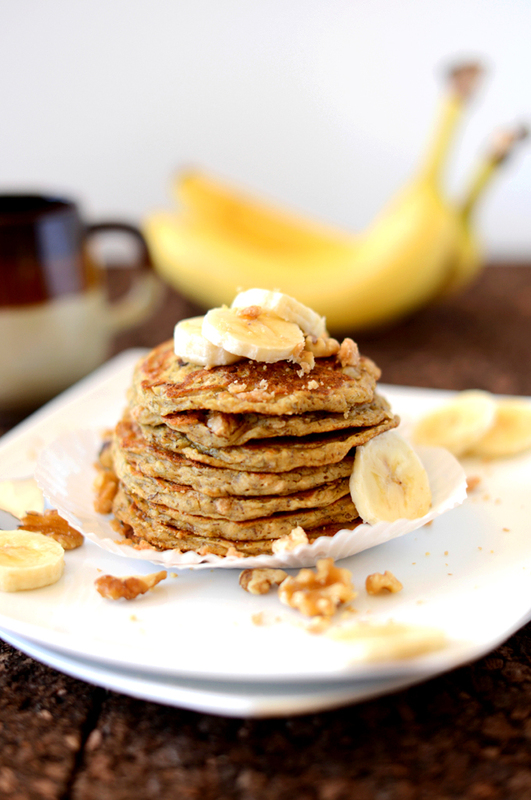 I love bananas, and I love making pancakes healthier. Win-win! Mariam, any time there is a whole banana in a pancake, you need to make sure you’re cooking your cakes over medium heat and cook them for a longer amount of time. If your skillet is too high you’ll be forced to cook them too quickly and that’s what will give them that undercooked texture and feel. Hope that helps! I adore nuts in my pancakes. I am making & eating these at this very moment. They are delicious! I followed the recipe exactly and it came out perfect :). Thank you! Did you know I’m a HUGE fan of animated food GIFs?!?!?!? You’ve inspired me to do more. I used to do them all the time!!! These pancakes are lovely, by the way. Yum!!! Yum this looks delish! I just might make them for breakfast before school tomorrow. Do you think I could make the batter the night before as I never have too much time in the morning? Bookmarked. My wife is going to love this. Thank you. Oh wow, I absolutely love the gifs and I’m a huge fan of banana nut anything so these are definitely getting bookmarked! i have made plain vegan and gluten free pancakes, but the incorporation of banana, and streusel sounds super yummy! HOLY HEAVEN. I wish I was sitting on top of that stack! These might turn Fat Sunday Breakfast into Healthy Sunday Breakfast! I seriously love all your pancake recipes! You are the pancake queen!